As far as I’m concerned, it’s never too early to be thinking about fantasy football. The more time spent doing research during the offseason, the more edge there is to be gained over your less-obsessed opponents – who are lazy and weak, whose minds will atrophy in the offseason, wasting precious time and energy preoccupied by trivial thoughts of work and family, or even worse, sports other than football. For the true fantasy football addicts amongst us, below you will find my “never too early” 2019 tiered rankings for the tight end position with accompanying analysis. We already tackled the quarterback, running back, and wide receiver positions. This information is also now actionable, thanks to best ball leagues with drafts taking place today on DRAFT.com and BestBall10s.com. 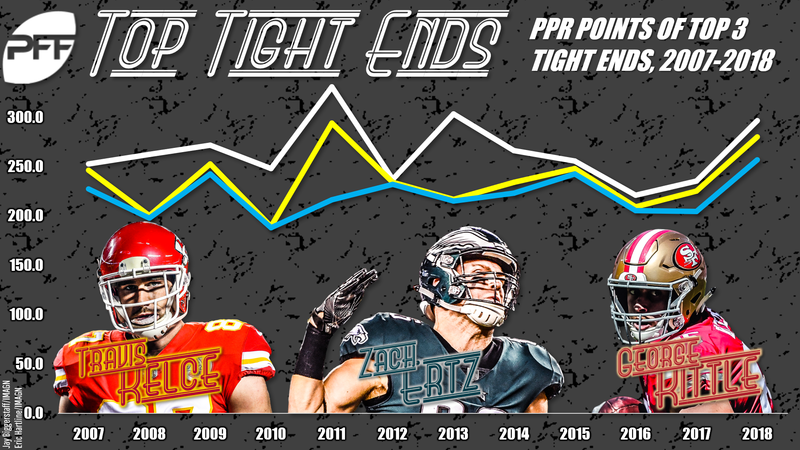 Owning any one of the “big three” tight ends offered you a massive edge over your opponents in 2018. I went more in-depth on these players here. For all of the reasons outlined here, I think Henry has the best chances of joining the Tier 1 tight ends and turning the “big three” into a “big four.” He rightfully stands in a tier all his own. I’d bet Howard becomes a fantasy superstar at some point in his career. Across the PFF era (2007-2018), Howard’s 2018 season ranked top-15 in yards per route run by a tight end. 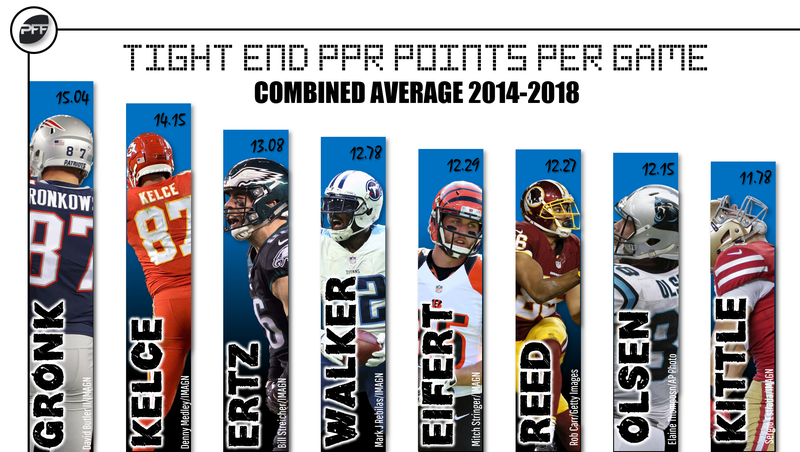 Howard leads all tight ends in yards per target (11.5) over the past two seasons, and, in 2018, ranked sixth at the position in fantasy points per game (12.1). Still, concerns involve Cameron Brate’s presence and new head coach Bruce Arian’s constrained usage of tight ends throughout his career. … Engram has less upside than Howard but is less risky as well. Over the past two seasons, Engram ranks fifth at the position in fantasy points per game (11.1). Walker and Olsen are deserving of injury discounts. Walker played on just 39 snaps in 2018 before suffering a season-ending injury but finished (across the previous four seasons) sixth, sixth, third, and seventh among tight ends in fantasy points per game. Olsen missed time with a fractured foot in 2017 and then re-fractured it and played through that injury for most of the 2018 season. He finished top-five in fantasy points across each of the previous three seasons. It seems unlikely at the moment, but there is a risk he retires before the start of the season. … If Gronkowski announces he’s back for another year, I’d be fine moving him up to Tier 2, but I think it’s more likely than not he’ll announce his retirement sometime soon. That said, even if he’s back for another year, Gronkowski seemed a shell of his former self in 2018, recording career lows (outside of his rookie season) in fantasy points per game (10.6) and PFF grade. Assume a massive gap between Tier 1 and Tier 2, and then a larger gap between Tier 2 and Tier 3, and then an even bigger gap between Tier 3 and Tier 4. The gap between Tier 4 and Tier 5 is a jump across the Grand Canyon in comparison to any of the other tiers. Njoku is a young player (22 years old) with plenty of talent, though we’ve yet to really see that talent materialize on the field. In 2018, he led the position in drops (8), but also ranked fifth in routes run (490), seventh in targets (83), and eighth in receiving yards (639). I think it’s likely he takes a step forward in Year 3. … Ebron’s production was terrific in 2018, but he was also out-snapped (331 to 164) and out-targeted (32 to 22) by a banged-up Jack Doyle in games both were active. … Graham played the near-entirety of the 2018 season with knee and/or thumb injuries, and (as a result) didn’t play well, but is still tethered to a top-three quarterback and top-five NFL offense. Unlike the other tiers, there isn’t much of a gap between Tier 5 and Tier 6. Cook finished fifth at the position in fantasy points per game (12.1), but it was far and away the best fantasy season of his 10-year career and is an unrestricted free agent this year. … Reed was once a top-three fantasy tight end whenever he was on the field (though that wasn’t often), but the 2018 iteration of Reed looked nothing like the older version. … Doyle is tricky for me. I may actually end up swapping him and Ebron, but for now I’ll have to yield to the Indianapolis tight end who stayed healthy and scored more points.